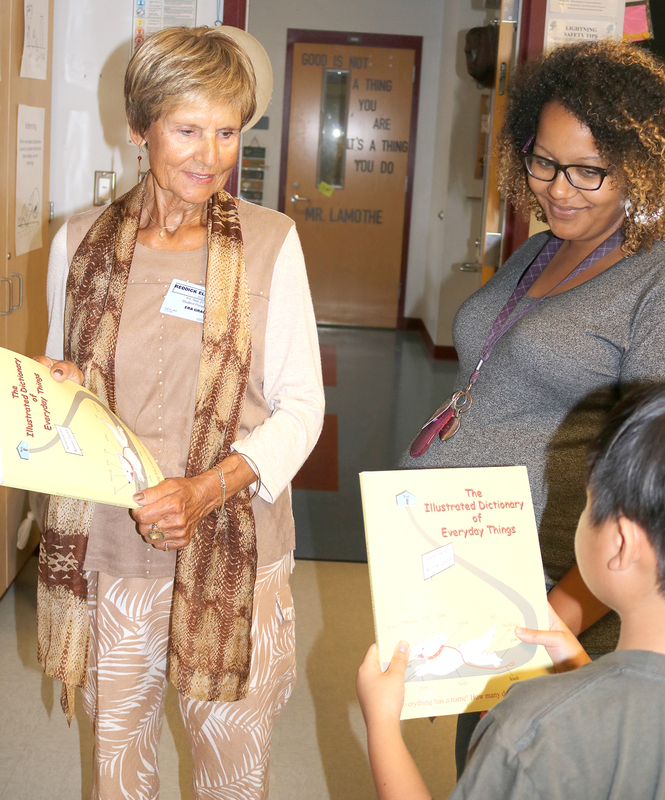 Janet Caruthers, right, a retired educator and dictionary author, presents sections from dictionary to students as J. Roth, Reddick Elementary principal, observes. She is now retired after a 34-year career as an educator, but to see Janet Caruthers interact with the attentive second-graders at Reddick Elementary last Friday you would think this veteran classroom teacher is at the height of her game. That’s because she still exudes the passion and the enthusiasm for teaching and for children, especially the teaching of reading and writing. Children in the second grade have been targeted to receive these dictionaries because children who do not read on grade-level by the end of third grade are four times more likely to drop out of high school without graduating on time. “This is serious,” points out Caruthers. According to the Florida Standards Assessment (FSA), 47 percent of Hillsborough County’s third-graders graders are reading below grade level and an astonishing 23 percent of Hillsborough’s third-graders were reading at Level 1, the lowest. In the South Shore area the percentage of third-graders reading below grade-level is much lower. Era Grace, left, of Sun City Center, helps distribute free dictionaries to second-graders at Reddick Elementary. Miquelle Williams, right, is one of the second grade teachers. How can this be? Fifteen percent reading proficiency versus 90 percent? That’s a huge difference, and this is nothing new. Are there better teachers at Bevis and Westchase? No. Are the brains of the children living in Fishhawk better than those in Wimauma? Definitely not, according to Caruthers. Caruthers believes that the main reason for the reading gap and the major difference is the size of the students’ vocabulary. She said one of the strongest predictors of academic success is the size of a person’s vocabulary. Generally speaking, children growing up in more affluent homes with parents who provide their children with nightly bedtime stories, high-quality conversation, and extended explanations when asked a question have much larger vocabularies than students growing up in homes of limited income and limited parental involvement. Generally, the larger the vocabulary, the better the reading comprehension. So what words are missing from these children’s vocabulary, asked Caruthers rhetorically? The foundational words, she said quickly and authoritatively. Sandra Rosario, a supervisor of the English Language Learner Program of Hillsborough County Schools, said about The Illustrated Dictionary of Everyday Things, “These are basic, foundational vocabulary words pertaining to everyday life that are not usually included in the instructional day. (For example: Parts of the body, clothes, things around the house). Therefore, providing this resource will allow students access to the foundational vocabulary that often times teachers don’t have the time to explicitly teach. 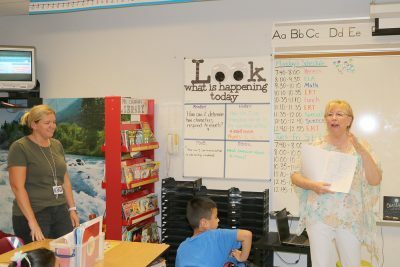 Janet Caruthers, right, explains the importance of learning and using fundamental words to second-graders at Reddick Elementary as teacher Kari Calderon, left, looks on. Caruthers said she recalls that in 1999, she was teaching second grade in Gibsonton Elementary and started noticing that there were things she was sure the students knew, but actually, they didn’t. Just common, everyday things. “Each time I discovered something they didn’t know, I would draw and label it on the board, and then they wanted to draw and label, too. I thought that was great, and so the students started building their own ‘Book of Knowledge.’ It was brilliant! They loved it,” remembers Caruthers. While she gleefully hands out the dictionaries to students, Caruthers points out the goal is to supply every second-grader in Hillsborough County with one of these dictionaries for their home library, along with recommendations for teachers on ways to use the dictionaries during teacher read-alouds, literacy centers, bell work, even for use by tutors. “The Illustrated Dictionary will help students feel smart, build their confidence, improve their writing, and their ability to learn from listening. I’d say, this is an important book,” concluded Caruthers. For more information or to help in any way, email janet@makereadingfirst.com.